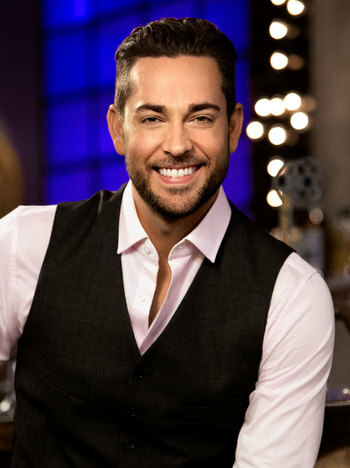 Zachary Levi Pugh, known professionally as "Zachary Levi" (born September 29, 1980), is an American actor and singer. Levi is best known for starring in the title role of NBC's spy comedy series Chuck for the entirety of its run, and also directed three episodes. Prior to Chuck, he appeared in a supporting role on the ABC sitcom Less Than Perfect. Since 2010, Levi has provided the voice of Flynn Rider in Disney's Tangled franchise, starring opposite Mandy Moore's Rapunzel. One of the songs from the 2010 film, "I See the Light" (a duet between himself and Moore), was nominated for an Academy Award in the Best Original Song category. He reprised the role in other Tangled-related media, such as the 2012 short Tangled Ever After, Tangled: The Series, and Kingdom Hearts III; in fact, part of the reason why he accepted the role in the first place was because as a fan of the series, he wanted to be in a Kingdom Hearts game someday. Levi is also notable for his work in comic book films. He was originally cast as Fandral the Dashing in 2011's Thor — the fourth installment of the Marvel Cinematic Universe — but had to pass on the role due to scheduling conflicts; he was replaced by Joshua Dallas in the film. When scheduling conflicts of his own left Dallas unable to return for the 2013 sequel Thor: The Dark World, however, Levi stepped back into the role, then returned for 2017's Thor: Ragnarok. In October 2017, it was announced that Levi had been cast as Golden Age superhero Shazam in his eponymous 2019 film, which is part of the DC Extended Universe. Adorkable: He's this in real life and some of his characters such as Chuck Bartowski and Billy Batson definitely count as well. Gentle Giant: He's 6'3 and a very friendly individual. Nice Guy: He's said to be a tremendously cheerful, laid-back, and compassionate guy who's a joy to work with professionally and loves to interact with his fans. For example, a child's artwork of Shazam and Jesus Christ together caused him to break down in tears. Separated at Birth: He has an uncanny resemblance to John Krasinski and Jimmy Fallon. What Could Have Been: He screen-tested for the part of Peter Quill in Guardians of the Galaxy, despite him already having a role in the Marvel Cinematic Universe as Fandral the Dashing.